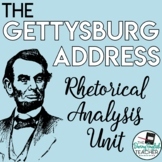 This engaging activity has students digging deeper into the famous speech titled The Gettysburg Address by President Abraham Lincoln. 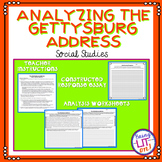 Students will be answering comprehension questions, doing a map activity, and understanding key vocabulary regarding the events that unfolded during this time period. 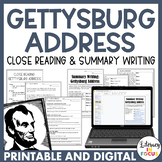 Students read and analyze the Gettysburg Address with this close reading activity. 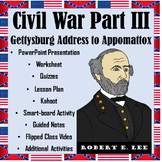 Meets Common Core Standards. 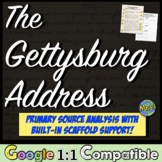 Primary source activity with document based questions. 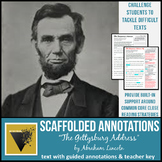 Abraham Lincoln Gettysburg Address & Emancipation Proclamation Primary Source Analysis Included in this lesson are 9 primary sources that refer to either President Lincoln's Gettysburg Address or the Emancipation Proclamation. 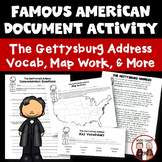 These include political cartoons and newspaper accounts of each one. 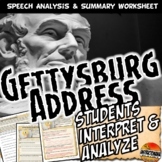 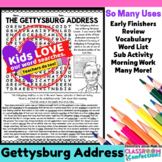 Gettysburg Address: Investigate, Restate, & Create with Lincoln's Words!